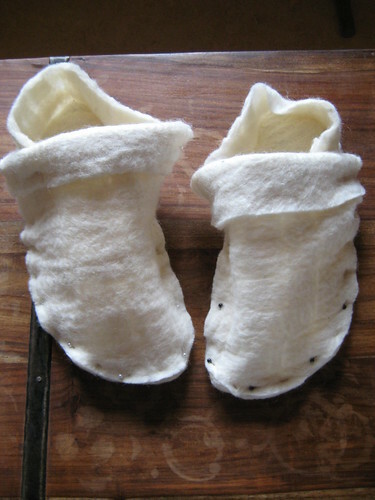 I’ve made my first (hopefully) successful pair of wet felted baby slippers (with the carded wool from the other day). 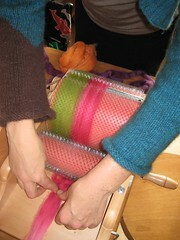 Photo 1: Rubbing the felt over the new washboard that Craig and I made a few days ago – works amazingly well. 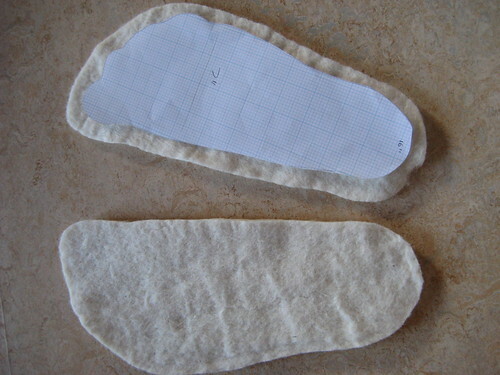 Photo 2: I cut the slippers in half and removed the pattern from inside, rubbed them again on the washboard with boiling water and then stuffed them full of newspaper to dry (I’m hoping the paper will help to encourage them to keep their shape, although I’m told wool has shape memory). Unfortunately one slipper seems to be a little bigger then the other one, I’m not sure how this happened. This I noticed when doing this style of slipper was that I managed to get seems around the edges of the slippers, which is now on the base of the feet. I’ve tried to smooth them out as much as possible but I’m not sure if it’s enough. Craig is going to sew in a leather sole to help with the longer lasting but I’m sure Luca will grow out of them before they die. 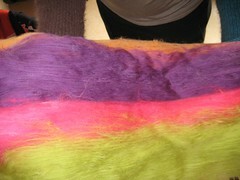 I’ve continued with playing around with needle felting and acquired some coloured roving from a friend to play with. 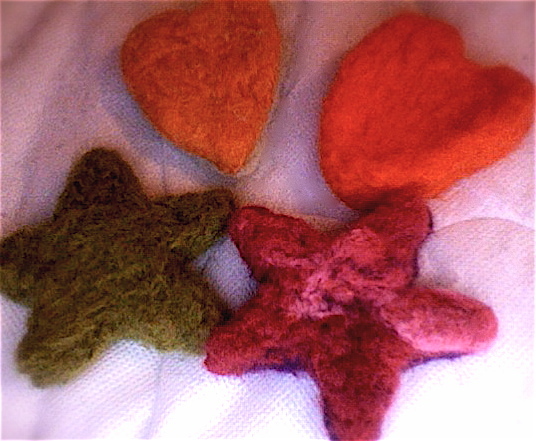 I’ve made these little star and heart toys as a gift using cookie cutters for the shape. I didn’t have much success with the really little cutters which are cute and I’d like to make work if I can. 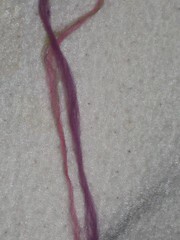 I think part of the problem has to do with the roving and part of it to do with the needle I’m using. Something else to play with when I get back home. these were both done with different techniques (sorry I forgot to take photos). The little man has a wire frame body that I built it up with carded fleece and the crocodile I made by simply getting a cookie cutter and stuffing it with carded fleece and took at it with the felting needle (specifically designed VERY sharp barbed needles that really hurt when they go into your fingers instead of the wool). I followed the instructions from this website for making the felted man, they also have patterns and instructions for a few other things like a bear and an alpaca. The instructions, in my opinion, are written for people who have a little experience with needle felting and aren’t strictly for beginners. 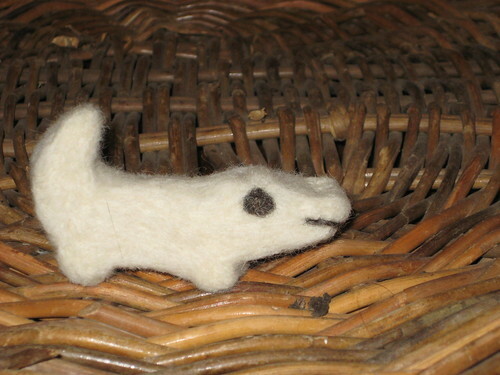 I’m thinking of making several felted animals, like the crocodile, for baby toys, mobiles, that sort of thing. This idea came from a video I watched on youtube for making small felted items with a stencil for card decorations. I simply improved on the stencil idea by using a cookie cutter and kept packing in the felt as I needled, turning it over as I went. 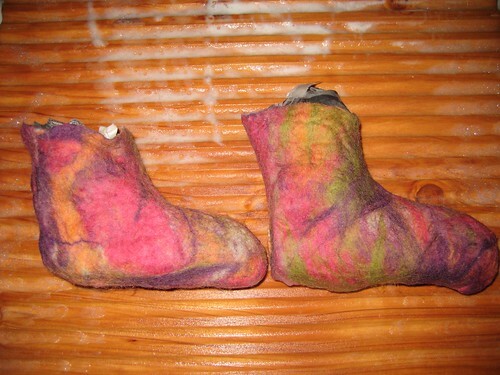 I also tried to make a pair of wet felted booties using instructions from peak.org. The theory is sound enough and I have seen it work, mine however, were a complete failure and didn’t hold together at all. I think this was more due to me rushing through the process rather then any fault in the instructions. I also think that I overlapped too much felt at the edges. 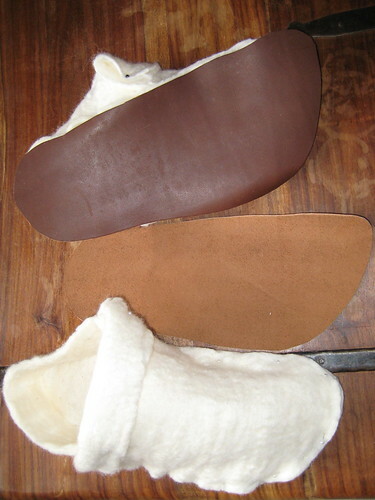 Another source for instructions and patterns for wet felted boots for bigger feet can be found here. I really want to share this video I foun, also on youtube, featuring the Mongolians felt making process, from sheep to yurt cover, I found it fascinating. Craig would like me to use the felt I have made to make him a pair of slippers. Step 1 – Trace his foot and come up with a pattern. I traced around Craig’s foot and then altered the shape to a more slipper like one, I’ve decided to have a clear left and right foot pattern but you could evenly round off the top. I also added seam allowance. The smaller piece of felt (the first one I made) is a little thicker and stronger then the others so I have decided to use it as the sole of the slippers. I’m thinking that I might also add a leather sole. 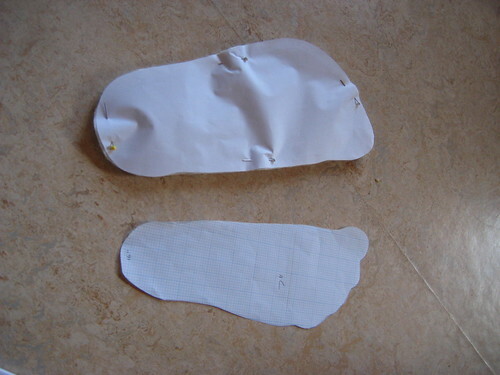 Obviously I then flipped the pattern and cut out a second sole (the picture shows the two cut out soles and the original tracing of Craig’s hoof). I decided to learn to felt this week and have really enjoyed it. 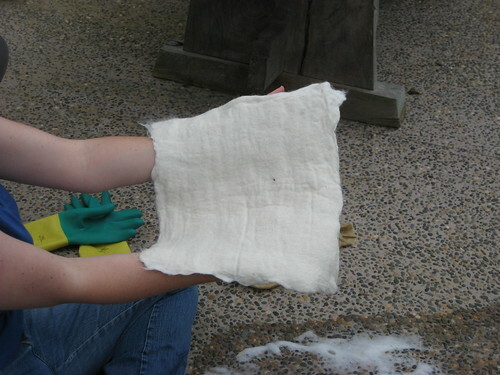 It’s a quick and easy way to make “fabric” with wool. I’ve been told that felt is both water and fire resistant. I chose the most basic method I could find for my first attempt, it didn’t require me to purchase or make anything before I started but was enough to give me some good first results and really wet my apatite. 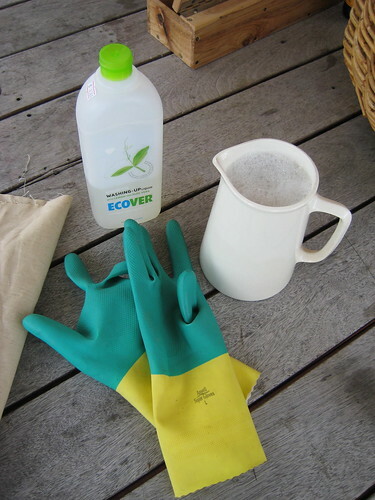 Materials: String (not pictured), material, rubber gloves, jug, boiling water, washing liquid, carded fleece (not pictured). 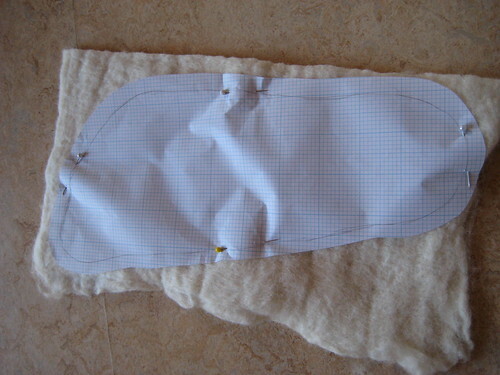 1) Layer the fleece, second layer should be in the opposite direction to the first, the third should be opposite to the second and so on depending on how thick or thin you want your felt to be. 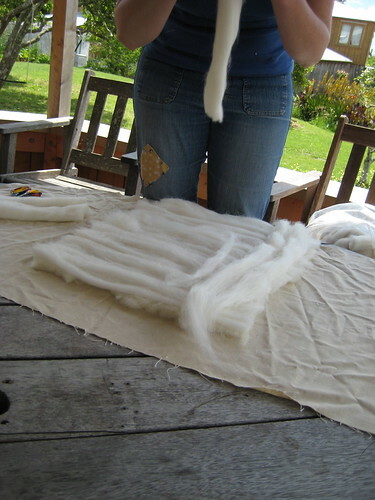 The first and second batches of fleece I made I just cut big long lengths from my roll of carded fleece (produced by Ashford). Don’t do this. I found I had a much nicer finished product when I just tore off sections and made several rows per level. 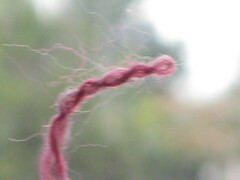 Even though all my attempts had two layers, my third attempt was a much thiner, more supple felt then the first two, with a more even appearance over all. 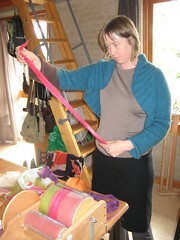 The method pictured results in a thicker felt and you can see lines from the rows of wool. 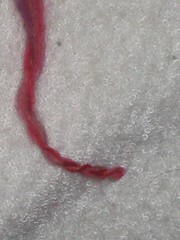 2) Pour boiling soapy water over the wool until it’s soaked all over. 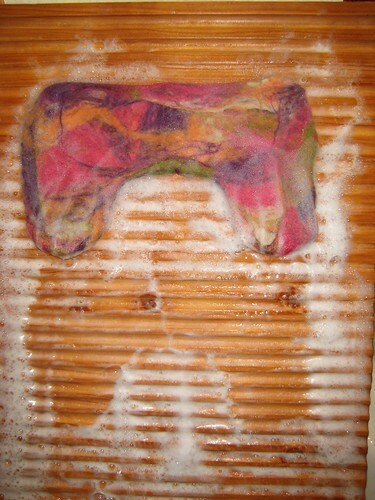 Gently pat the wet wool all over and then start to rub in small circular motions for several minutes. Be gentle but not too gentle. When you apply hot soapy water to the wool, it encourages the scales to open and when you rub it, you are helping the scales to lock together (or so I’m told). 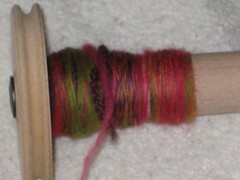 If you rub too hard you will cause the fibers to pull apart and create holes in your finished piece. You want to encourage an even texture. 3) My material is too long for this piece of felt, but, once you have finished rubbing the wool, roll it up like a sausage. 4) Fulling. Tie string in the center on on each end of your roll to help keep everything together. I chose to do this on the gravely paving (some methods tell you to use an old fashioned washboard, or instead of material use a bamboo mat, the back of a rubber door mat, anything that has a texture to it), the method I was following actually just says to roll it on any flat surface. Simply roll for about 10 minutes, give or take, and then unroll and reroll in the opposite direction (top to bottom, then left to right). 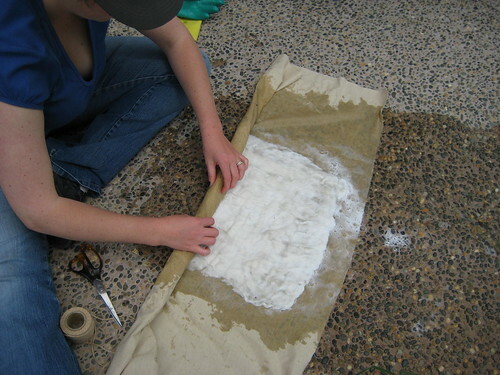 Re-tie your material and roll for another 10 minutes or so. 5) That’s it. Finished piece of felt. 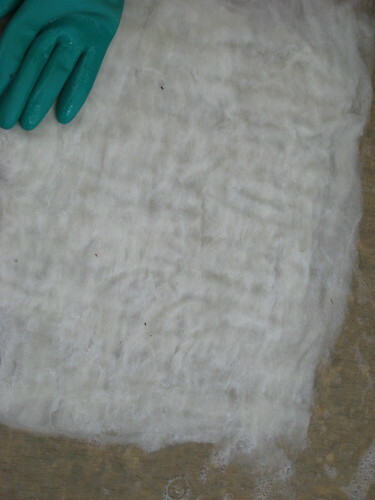 6) Remove your felt from the material and give it a rinse under a cold tap to remove the excess soap (hot water will encourage more shrinkage). 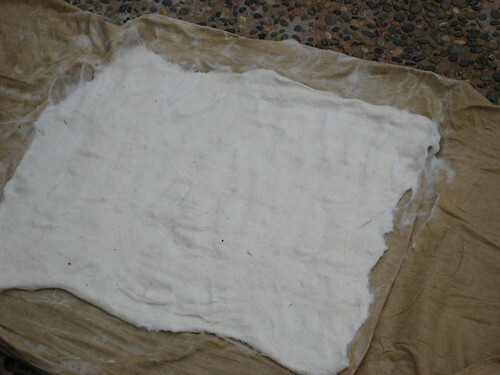 Hag it out to dry naturally or you can even iron it. 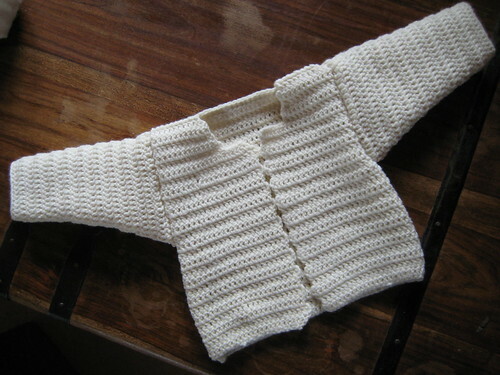 I found that there was only minimal shrinkage of around 10cm from my original layering to the completed product. It took me half an hour to make this piece and 35 minutes to make another larger piece. Quick and easy and loads of potential, I’m a felt convert.